This painting is 22" x 28". As you can see, I used a canvas with a previous false start. A glaze of yellow with some white highlights. Adding flowers and bright turquoise. 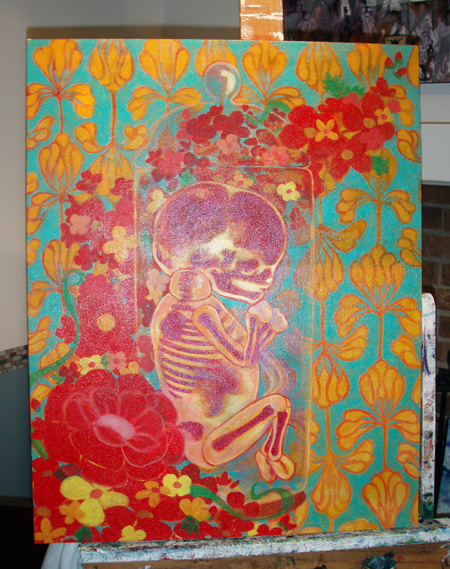 I wanted this piece to have a Mexican inspired feel because of their close relationship to death. Segmenting baby body to emphasize it is a doll. Decided to break flowers into smaller flowers. Bye bye flowers. This is why I am working out the compositions on paper now. Bringing back some of the background pattern. Creating a random shape. I still have no idea what I want to do with the left side. Unifying the plants with the new freaky shape. Adding internal shapes to the blossoms and some vines. The background blossoms were there, but hard to see, so I added some darks to make them pop. Defining Vivarium shape, adding leaf pattern to the freaky blob. Added a red glaze to separate more. Trying to get the blossoms figured out. Adding details to the blossoms. Added dark teal to the upper right corner to try to control the chaos. The red was too distracting from the baby, so I started adding blues and purples. Blossoms get a pink glaze to help them pop again. Purple glaze to push back the leaf layer. Added "seed" pattern to glass and a cut-out to the leaf layer. Blocked out upper portion in blue-violet, will be more purple soon. Detail of the background and legs.